iamVibes sweater (c/o). Zara necklace. Jeffrey Campbell shoes. I haven't worn thigh highs with shorts in a cool minute, but it's getting to be that season again. 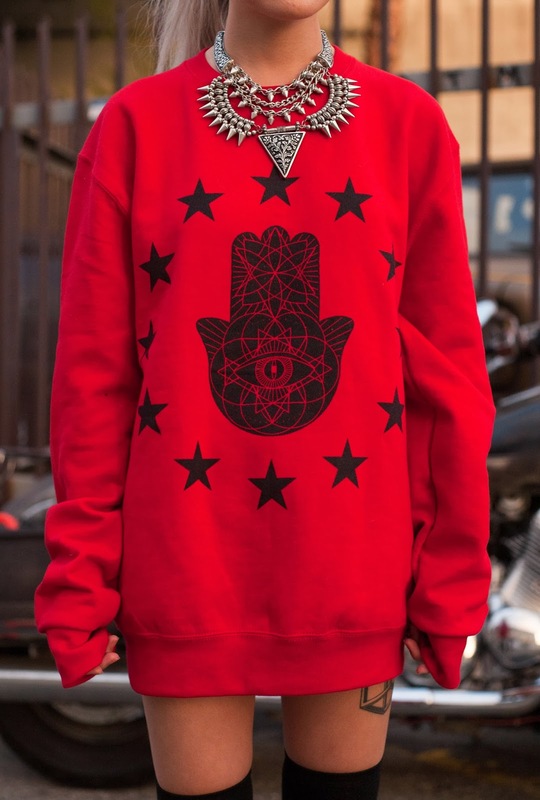 There was nothing better to pair them with than this oversized sweater packed full of positive karmic energy. The description of this sweater can be seen here. It's really insightful. The owner, Tom, puts a lot of thought, effort, and good energy into each piece. Not only does it give off good vibes for your inside, it's warm and has a soft and fuzzy lining for your outside. It's just feel-good vibes all around. The sweater worn as a dress with thigh high socks is so beyond perfect. I love the feeling of wearing thigh high socks. They're just so cool. Style, elegance and beauty personified. This is a beautiful outfit, loved it. Also check out amazing designer v neck, cardigan and cashmere sweaters and shawls from the house of AprilMarin.